The Apollo Theatre in Harlem, New York is the most famous performance venue associated with African American entertainers. The New York Theatre that became the Apollo was built in 1913 by Jules Hurtig and Harry Seamon, two burlesque theatre operators and opened as Hurtig and Seamon’s New Burlesque Theater. In 1928 the Apollo was purchased by Bill Minsky and renamed the 125th Street Apollo Theatre as Harlem was rapidly becoming the largest urban black community in the nation. Nonetheless both the audience and entertainers at the Apollo remained all-white. Sydney S. Cohen and Morris Sussman purchased the Apollo in 1932. 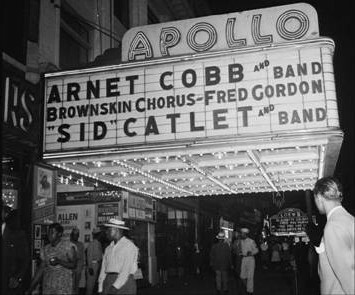 On January 26, 1934 they reopened the Apollo as a black-oriented theatre, nearly twenty years after it originally opened. The first black performance was an “all-colored review” called Jazz a la Carte. Theatre owners Cohen and Sussman donated all of the performance proceeds to the Harlem Children’s Fresh Air Fund. After Sydney Cohen’s death, Frank Schiffman, owner of the Harlem Opera House, became Sussman’s partner. With that partnership, the Opera House and the Apollo merged to become for many years the only New York City Theatre to hire black entertainers. The Apollo soon featured an “amateur night” where unknown performers appeared. On November 21, 1934, 17-year-old Ella Fitzgerald made her singing debut at the Apollo, winning a $25 prize. Over the years other famous performers who debuted at the Apollo included Billie Holiday, Sarah Vaughn, Bill Cosby, Godfrey Cambridge, and in later years, Luther Vandross, Lauryn Hill and Mariah Carey. The Apollo Theatre, now holding landmark status from the U.S. government, the State of New York and New York City, draws an estimated 1.3 million visitors and is featured in Showtime at the Apollo, a nationally syndicated variety show promoting, as the theatre has done since 1934, new talent. Jack Schiffman, Uptown: the Story of Harlem’s Apollo Theatre (New York: Cowles Book Company, 1971); Ted Fox, Showtime at the Apollo (New York: Holt, Rinehart and Winston, 1983); “About the Apollo Theatre.” The Apollo Theatre. http://www.apollotheater.org/about_us.html. 6 Dec. 2007.